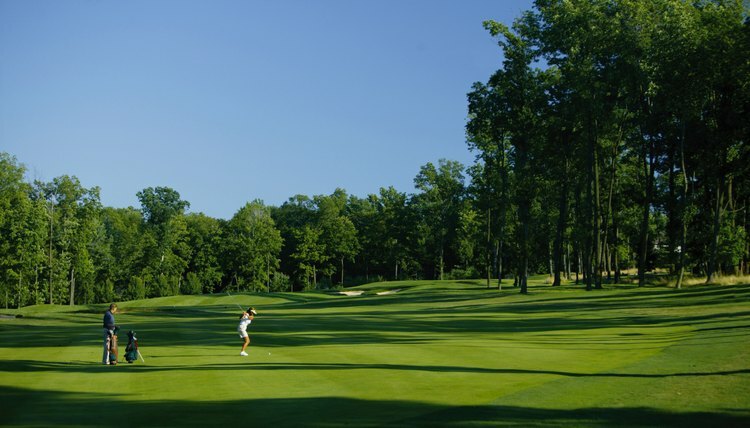 Golf course greenery may help combat global warming. The idea that humans contribute to global warming, also known as climate change, is based on "strong observational evidence and results from modeling studies," according to the American Meteorological Society. The question of whether golf courses help or harm the effort to slow global warming has no easy answer, because different courses affect the environment in different ways. Built and maintained properly, however, golf courses can be environmentally friendly. Golf courses are homes to large amounts of green plants, which add oxygen and remove carbon dioxide from the atmosphere. Therefore, as golf course architect Mike Hurdzan explains, golf courses “sequester a lot of carbon that reduces global warming.” Hurdzan notes that golf courses are particularly environmentally friendly when they’re built on empty spaces such as landfills or former industrial sites. Environmentalist Brent Blackwelder asserts that cutting down a forest to build is course is environmentally harmful -- he successfully opposed building a course near a Michigan river, for example -- but he agrees that building a golf course on “degraded land” may be beneficial. He also advocates the use of solar and wind energy on golf courses. In 2009, singer/actor Justin Timberlake opened the first golf course in the United States to receive LEED (Leadership in Energy and Environmental Design) Platinum certification from the U.S. Green Building Council. The Mirimichi Lakes course in North Shelby County, Tennessee, features solar-powered golf carts and advanced irrigation systems that use as much rainwater as possible. The availability of water is another key environmental issue faced by golf courses. The water issue is also tied to global warming because increasing temperatures mean decreasing amounts of snow melting into rivers and reservoirs. Because ocean water is too salty for human consumption or most irrigation purposes, water shortage is a serious issue in much of the world. At the same time, Audubon International estimates that a typical U.S. golf course requires 312,000 gallons of water each day for irrigation. Some courses are adapting by using recycled or reclaimed water -- typically sewage water that’s been cleaned -- while new forms of grass are being created that require less irrigation or will tolerate irrigation with seawater. Excessive water may become a problem for some golf courses in the 21st century if global temperatures continue to rise. A 2008 “Golf Digest” article said 645 U.S. coastal golf courses that lay less than 2 meters above sea level will be endangered if sea levels continue to rise. Various scientific and environmental groups predict a sea level rise of 1/2 meter to 6 meters by the end of the century. The article noted that "high tides, higher winds and tropical storms" forced The Links Course at Wild Dunes in South Carolina to shorten its 501-yard, par-5, 18th hole to a 190-yard hole with a par of 3. Golf Digest: How Green Is Golf?